A silky pink face primer that makes skin appear smoother and brighter. Contains light-reflecting pigments to help brighten all skin tones and raspberry & chamomile to soothe skin. But I LOVE this product. Light as air, it blends in like a dream, and adds a nice glow and a smooth surface to your skin. Plus it smells like Rockets candies! You can't lose! I bought this with some skepticism; I have quite oily skin, so I do not like the aid of primers especially ones that contain silicon. 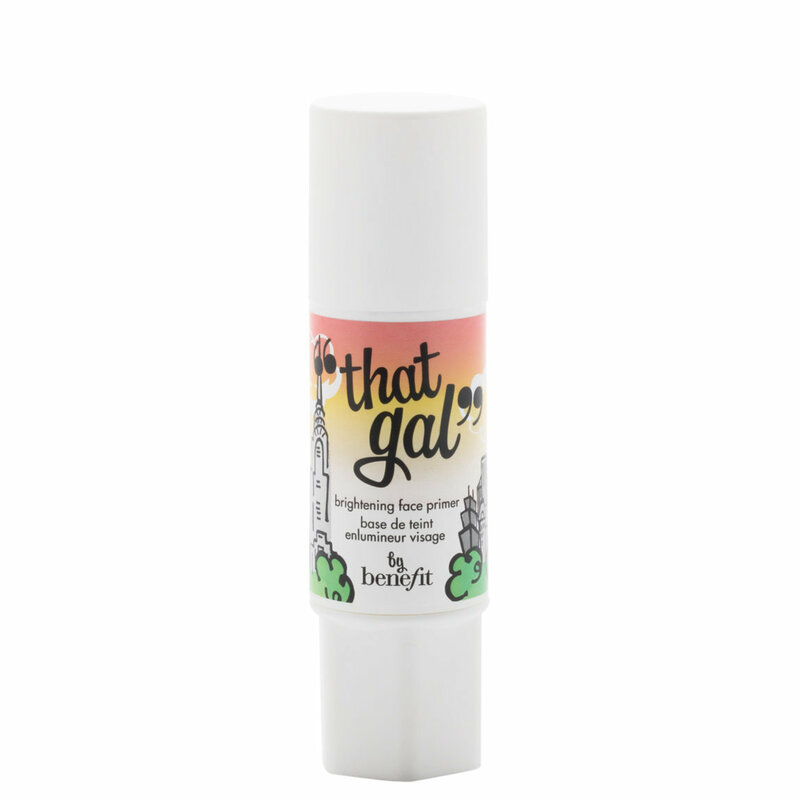 That Gal is very quick and simple to put on with the click tube applicator; you can get just the right amount to dab on cheeks, forehead, nose and chin. A little goes a long way! I use my Make-Up Forever Concealer and finish off with a brush of Benefit's Hello Flawless Powder. I was quite surprised to see how bright my skin was, best of the primer doesn't feel heavy or thick. The first thing that I noticed about this little primer was the sweet smell. It was a bit reminiscent of a strawberry sorbet smell. I applied a small amount to my face and I noticed an instant brightness to my face. It also gave it a soft glow. I was automatically impressed with it and loved how my face was looking that I almost did not put any foundation on afterwards. It did not feel heavy or thick on my face. When I did put my foundation on it went on smooth and evenly. The packaging is also super cute and easy to use! I know a lot of people don't like this product because it makes them too pink. That's not a problem for me because I have yellow (almost olive) undertones and the pinkish tint in Benefit's That Gal really works to counter the sallow tones of my skin. I find that I can use this with or without makeup on top. Some days I can just use this and powder and I'm good to go. It doesn't give me an oily look because there are no overt "shimmers" that most other brightening primers have. Truly brightens best primer I ever had !!! I've been using this product for months now, and it's just lovely. The raspberry scent isn't too potent and it's deliciously girly. It gives the perfect dewy glow and leaves the skin smoother. Also it's light weight and super effortless to use. Has enough coverage that you can wear it alone. Great for even out your skin tone. I love the glue-stick type of this primer as it doesn't spill and you don't have a hard time squeezing the product out. Few clicks and voila! You're good to go. It makes my skin glow and helps my foundation lasts longer. Love the scent too! I do love this stuff. I actually prefer it alone than underneath foundation. I look alive when I wear it. I like it under foundation as well but, I have to mix it with my Porefessional sample because I have enormous pores.